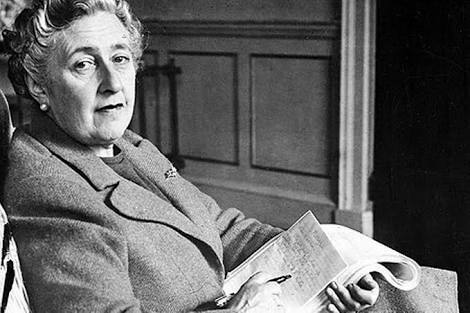 Our next article has taken us on a trip away to celebrate Agatha Christie’s birthday (1890-1976). We do love a good murder! Just picture us in a glorious mansion huddled together on one metre of the six-metre couch to watch our favourite character, Miss Marple. The four of us are squinting at an iPad mini, having unsuccessfully tried to work the massive screen DVD player and surround-sound, despite the numerous phone calls to tech support (aka the kids). Babs (that’s Vikki) recalled that when we were children, we loved playing Murder in the Dark, so we decided that this weekend we’d rekindle this youthful game. Unfortunately, all this menopause business meant that none of us could remember how to play. So we turned to Agatha! Having checked her out on Google, we found she was a very interesting character herself with a bit of an air of mystery, like when she disappeared in 1926. We picked A Murder is Announced (1950) to read and Janet remarked that good old Jane Marple is certainly preferable to liquorice lips Hercule Poirot, who she finds completely dull and unintelligible. And that ridiculous moustache, not to mention the way he always talks about himself in the third person. Absurd. Anyway, instead of being so suspicious of foreigners we decided that Miss Marple should have focused more closely on the identity of the murderer, because Rudi, Miss Murgatroyd and Bunny are all murdered before she gets her act together. A bit slack we thought. But by far the best thing about A Murder is Announced is that it cured Sandra’s insomnia. She was thrilled, because now she knows that instead of reaching for the melatonin when she’s exhausted, she can pick up an Agatha Christie novel and fall into a blissful sleep. Still, Agatha’s influences are far and wide and we should be grateful for her murderous contributions – which have led to the bulk of our television viewing. Oh the joy of beautiful Midsomer. What do you think the population is now? The real estate market should certainly be affordable. Like Miss Marple, poor Tom and later John take so long to solve the crimes that not only are many more villagers murdered, but we’re slumped on the couch snoring and still don’t know who the murderer is. If only someone had murdered Tom’s annoying wife Joyce. Same with Father Brown – so many murders in his parish. Makes you wonder. As Neen is an expert in this field having watched every episode of Murder She Wrote several times, she drops the remote control to comment on the wonderful Jessica Fletcher, a sleuth who resembles Miss Marple in many ways – including her fashion sense and her ability to knit and ride a bike. Knowing her reputation and her tendency to attract murder it’s a good thing she isn’t here on our weekend away – although she would know how to play Murder in the Dark. And how come all the police officers are a bit thick in all these shows? What is our fascination with murder anyway? Janet’s started with Homicide when Leonard Teale asked a stunned-looking extra to take evidence down to forensic. She’s always fancied taking something down to forensic. What is it and where is forensic? Is it downstairs? This then reminded us all of a horror episode of Matlock Police from our childhood when a traumatised little girl was singing “Frère Jacques” on a squeaky swing. Sandra hasn’t watched many murder shows since then and if she does she’s usually to be found in the foetal position. And whatever you do, don’t play “Frère Jacques” to her. Ever. A good murder in Babs’s mind involves chalk marks and Leslie Nielson. We can’t finish this article without mentioning the gardening and detective skills of Rosemary and Thyme. These girls can prune your roses and mulch the petunias while solving the murder of the body in the vegetable patch. You go girls. Chatting about Agatha reminds us of our fabulous Aunty Pat who was a great fan of Agatha Christie and always inspired us in so many ways, including a love of reading. Sadly, we watch too much TV, but that’s alright. We’d rather watch Miss Marple than read those books. Finally Famous, a Melbourne-based group of identical book-clubbing cousins: Janet, Sandra, Vikki and Janine, who band together to write informative stuff about books that may not be as informative as you’d like.